Playing competitive soccer involves dealing with the risk of injury and sometimes recovering from injury. Hard tackles, sharp cuts, head balls, dangerous kicks and awkward falls can lead to unfortunate injuries and a host of consequences to wade through. However, the costs of injury are more than physical with the mental component being much more difficult to manage. 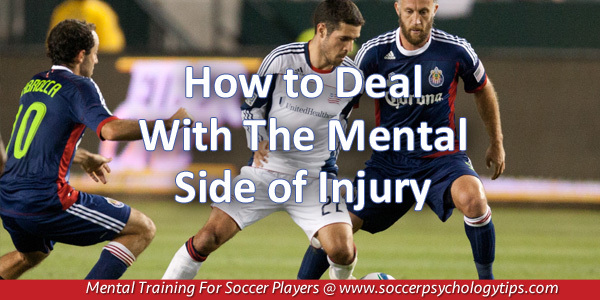 The physical pain many soccer players can deal with but the mental strain is often torture for athletes. Tom Elliott, forward for Millwall FC of The Championship League, signed his first professional contract as a teenager. Not far into his career, Elliott dealt with injury issues including hamstring problems and an avulsion fracture. Elliott bounced around from team to team and wondered if he would ever get his career back on track. The ordeal was mentally grueling for Elliott. With his career hanging in the balance, Elliott decided he needed help in order to deal with the mental aspects of injury, so he started talking to a sport psychologist. With his sport psychologist on board as a member of his support team, Elliott had a career best season, at the age of 26, with 15 goals for AFC Wimbledon during the 2016-17 campaign. It’s not enough to just do physical therapy to deal with an injury. If you ONLY focus on physical rehabilitation after an injury, you are doing yourself a great disservice. In order to bounce back from an injury and play even better than before, you MUST deal with injury in both physically and mentally. Acknowledge your fears when returning. The first step in overcoming your fears is to admit you have them. These are very real fears but if you confront them, it will diminish their intensity. A strong mental approach to injury and overcoming mental scars can put you back on track faster after injury rehab.